Here is your chance to vastly improve your investigative interviewing, statement taking and people skills that will teach to gather 35 percent to 50 percent more facts in your investigations! 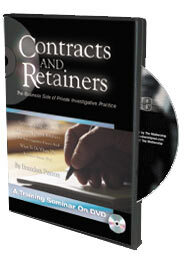 This new ground-breaking DVD training program is a complete seminar on interactive DVD based on decades of the unique and highly successful statement-taking refinements and developments of John Hoda. Mr. Hoda is known nationally as one of the leading experts in the country on investigative interviewing and statement taking simply because he had dedicated his life to the study and practice of these vital investigative skills. This training program gives you major hard-hitting methods, know-how and techniques you can employ in the interviewing and statement taking process that will vastly improve the facts you undercover in any type of investigation. 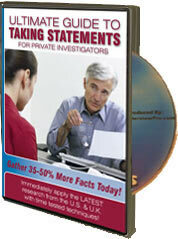 The Ultimate Guide to Taking Statements will be of extremely high value for novice and veteran investigators alike. When it comes to investigative interviewing, sometimes you only get one shot at it so it's important that you not only do it right, you do it with the skills and techniques of a professional. Highly soulful interviewing results is exactly what this powerful new training program on DVD hands you. Using John Hoda's Ten Point Structure To The Investigative Interviewing Process, you will obtain between 35% to 50% more facts in your investigations. Make Your Own Choice Right Now: It's time for you to act now. You have a choice to make. You can continue to go along with mere average or below average interviewing and statement taking skills and not even know about the mistakes you keep making again and again by not getting this training program now. You can also choose to take action to vastly improve your investigative interviewing and statement taking skills right now and start obtaining between 35% and 50% more facts in your investigations. That choice is yours to make right now.